Brian and I got engaged on December 10, 2017, and it just feels unreal that it’s almost been a year. 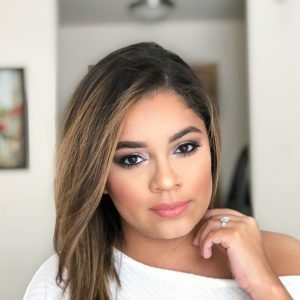 I have been on the wedding planning train the moment I got engaged because I knew how hard it was going to be to do this especially because I am getting married in the fall of 2019. Fall weddings are definitely popular. 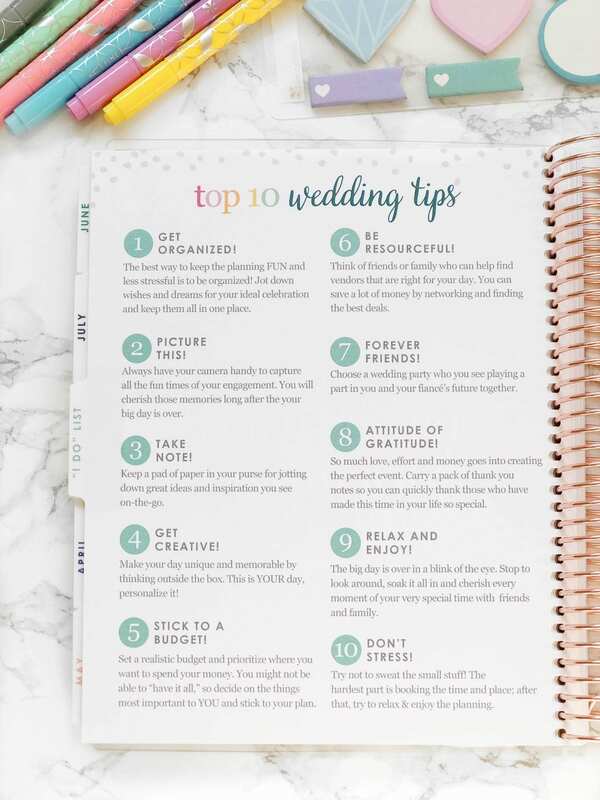 In order to stay on track of my wedding, I have been using the Erin Condren Wedding Planner. Let me just tell you, that I did specifically order a wedding planner before but it wasn’t what I wanted to honest. 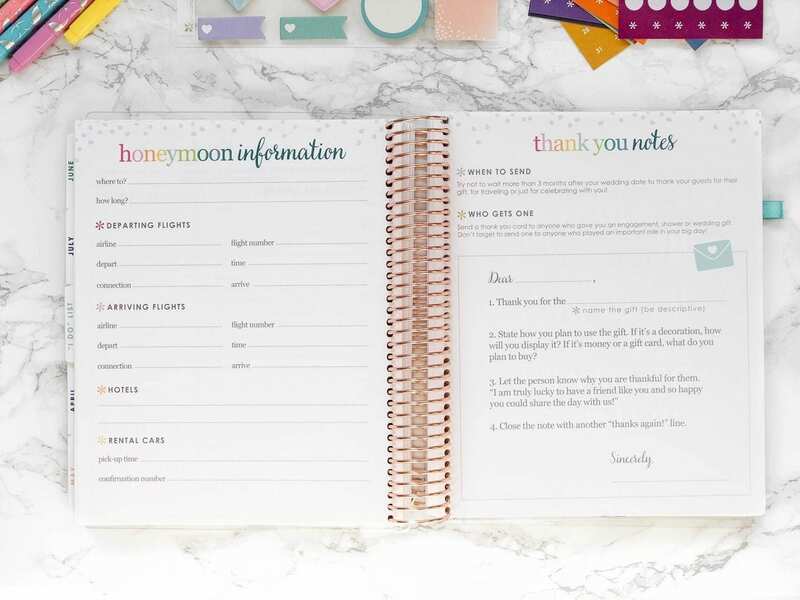 It definitely doesn’t compare to the Erin Condren wedding planner. 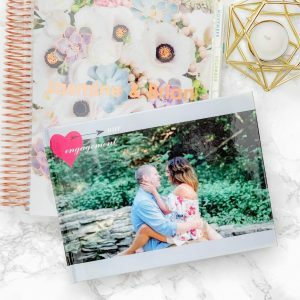 I recently received the Erin Condren Wedding Planner in exchange for a review. 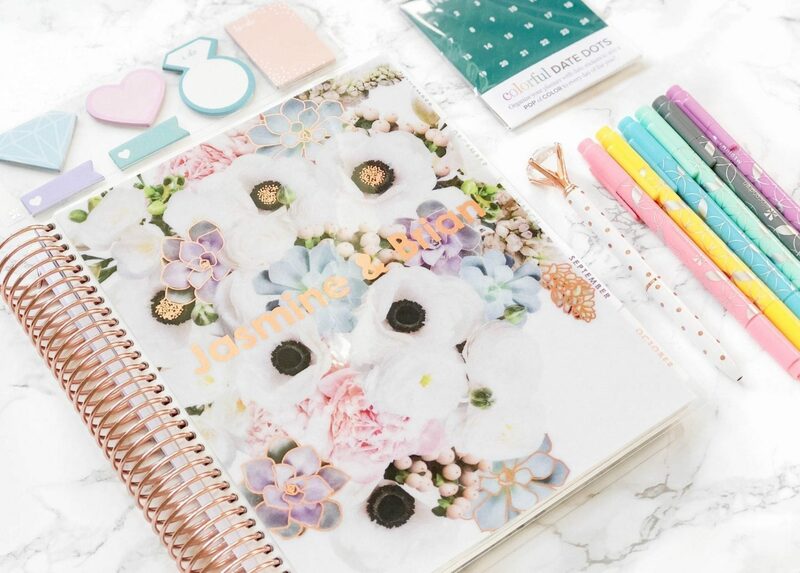 When you order your planner you are able to customize the front of your planner to how you want it. 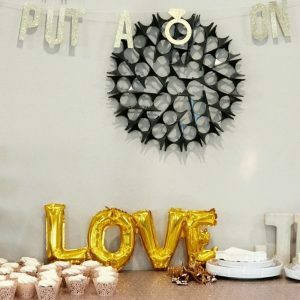 Which is always fun for brides, especially if you want to include your future last name. 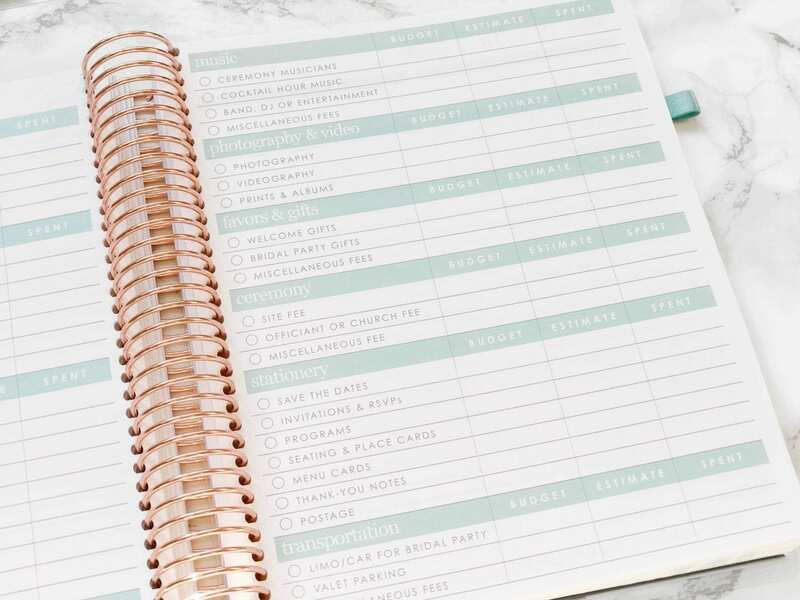 Monthly Tab – I noticed that on each of the monthly tabs you do get a wedding quote which is perfect for a little inspiration. 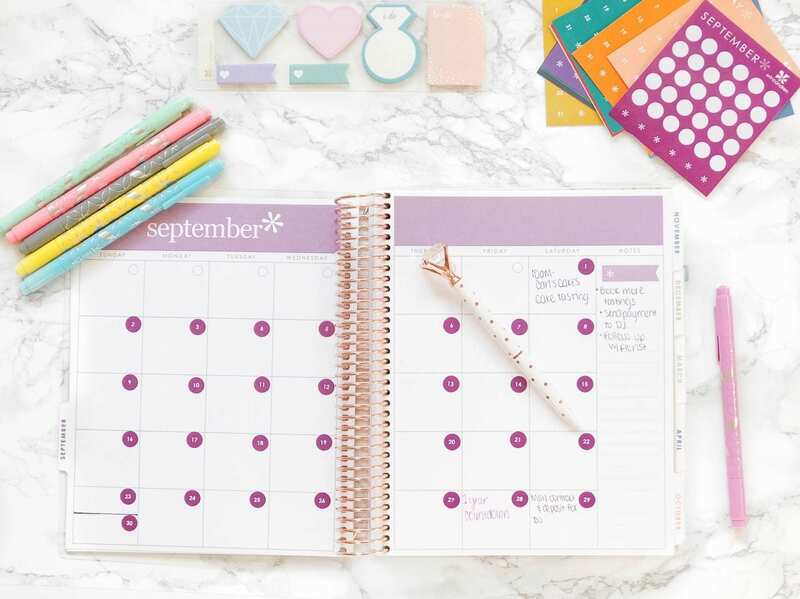 Sadly the calendars don’t come dated, you do have to fill in the months otherwise you can always purchase their matching calendar dotted stickers. Which they provided. 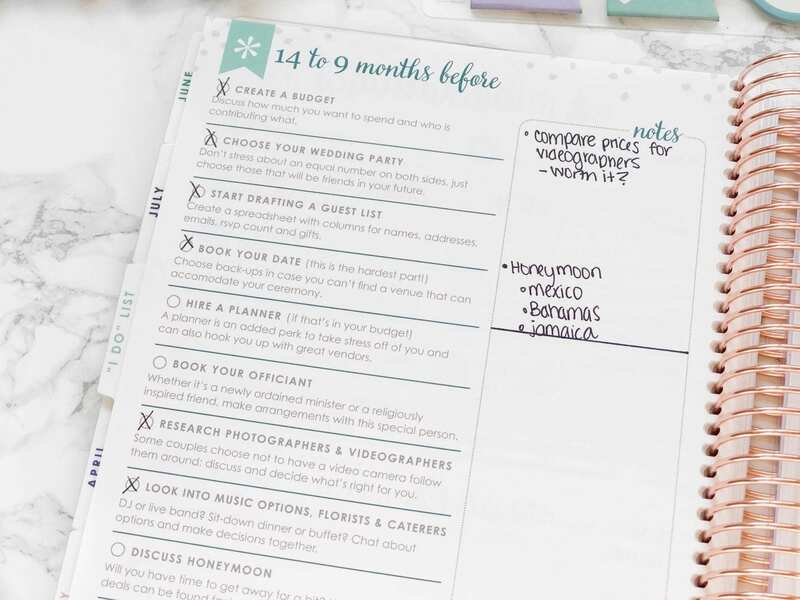 “I DO” Tab – This section is where you get to keep track of your planning. 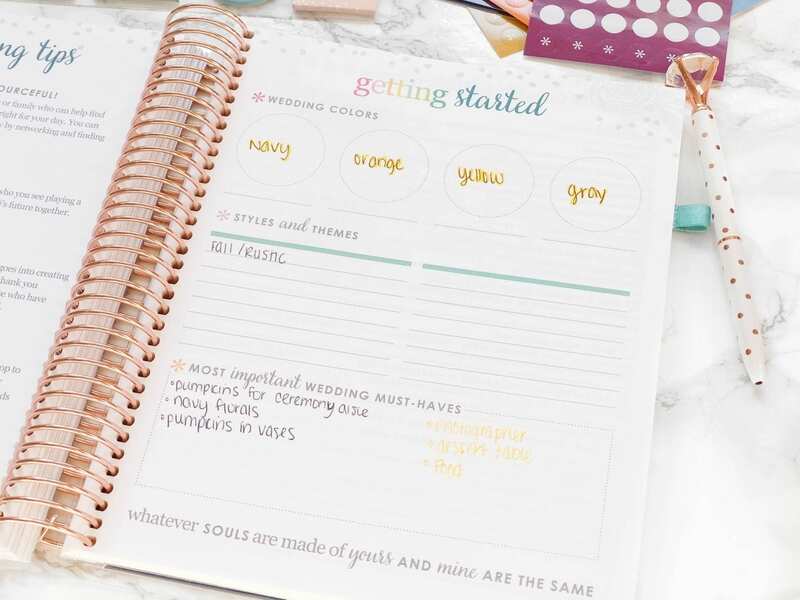 “Getting Started” you are able to write down your wedding colors, styles and themes, and of course what’s important must-haves for your wedding. 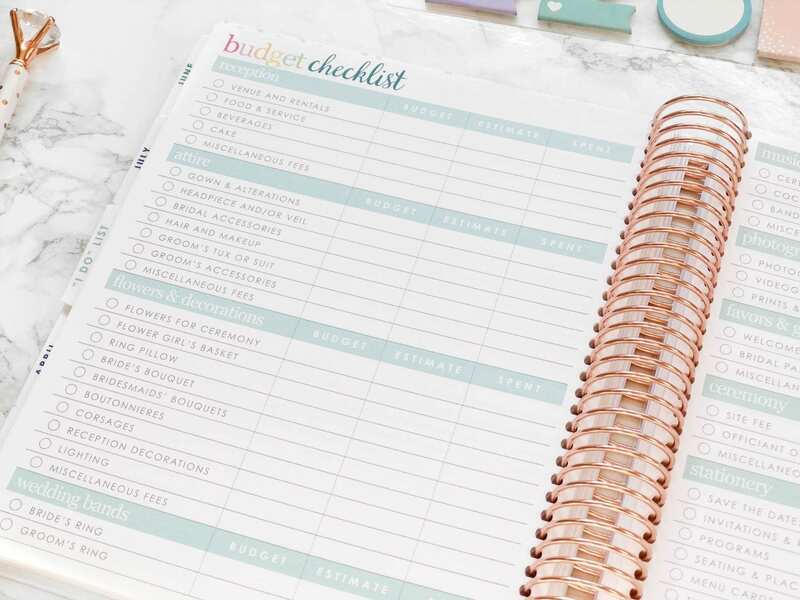 Monthly check-off list to keep track of your planning. 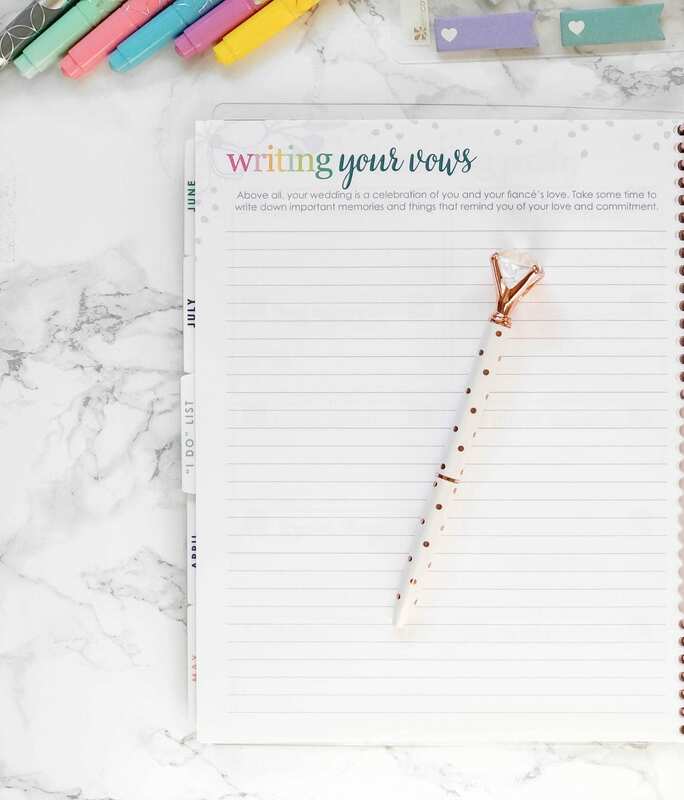 Writing Your Vows – Because every bride should start writing their vows early. I know I’m going to. Picture This is a great section so you can let your photographer know what exactly is that you want photographed on your day. 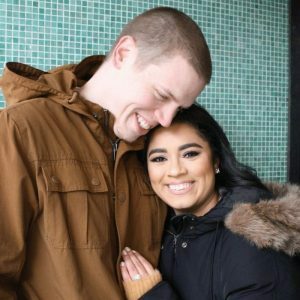 Music List perfect to start writing down songs you want your DJ to play or potential first dance songs. Flowers perfect little section that includes what flowers are best during spring, fall, winter, and summer. 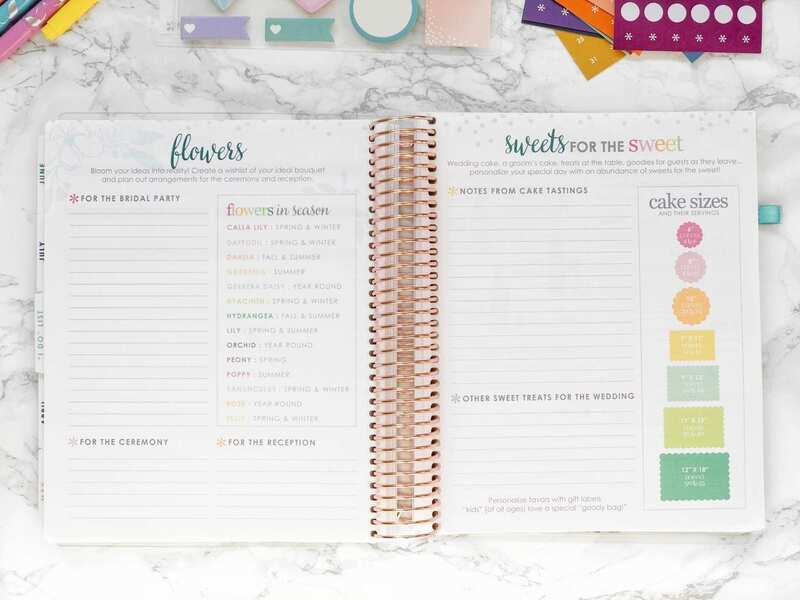 Sweets for the Sweet – jot down notes from your cake tasting and other treats. Cheers – If you’re planning to bring your own alcohol, this is perfect so you can keep track of what you want for the wedding. But even if you’re not bringing your own alcohol this can still be useful. Wedding Menu – This has two sections, rehearsal dinner, and reception dinner. If you’re planning to go on a tasting then you can definitely jot down notes. Vendor Contact List cause this is a must to keep track of your vendors. 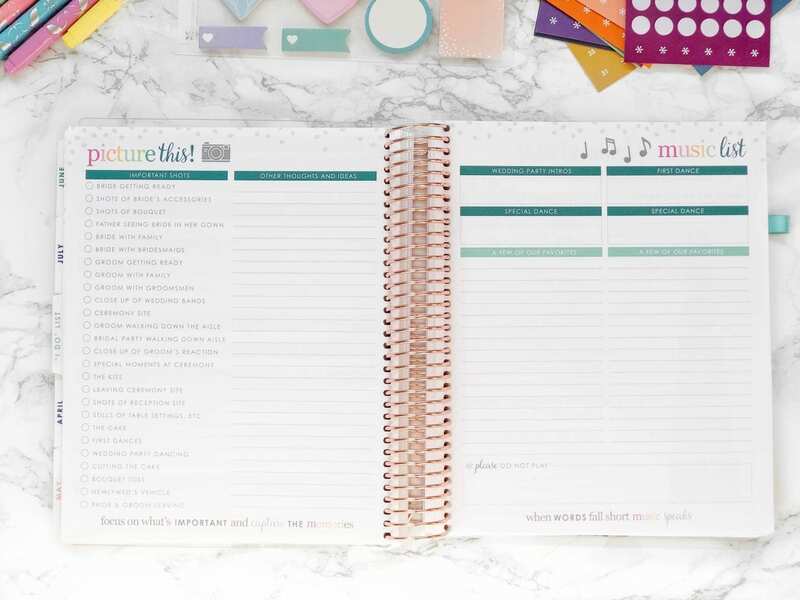 What I didn’t like about the planner? The only thing I didn’t like from the planner is the “memories” section, it’s basically like a scrapbook. Personally for me, I don’t find this useful. I don’t know who would actually put photos on their planner. Other than that, I personally see myself using the planner. It has a great notes section so I can jot down any ideas that come to my head. The stickers that come with the planner is a good touch to the planner. Cause who wouldn’t love stickers. 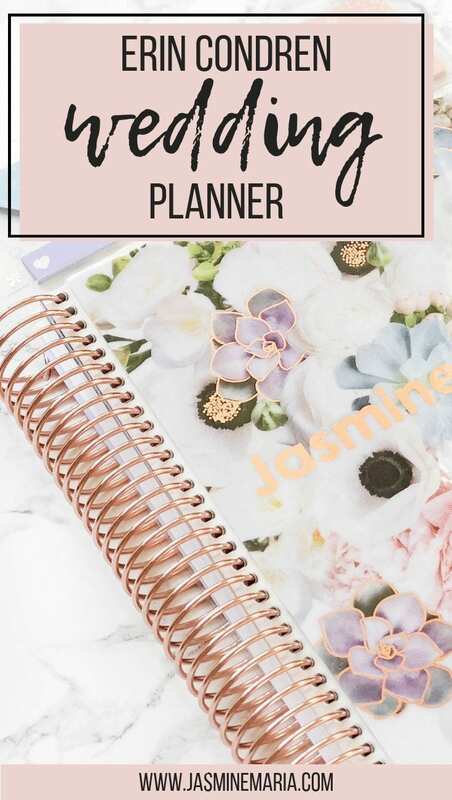 I do recommend this planner if you’re a bride to be.